Journey to the Heart is an amazing book, filled with daily meditations. The way Melody Beattie writes makes it so easy to connect with the words. It’s as if she understands your thoughts. She took her experiences in life and turned them into short daily readings to empower others along their journey. “Trust the rhythm of the universe. You are right where you need to be. This book is truly a guiding light towards empowering yourself. And I can personally say this book has shifted my perspective on more than one day when I’ve been stuck in the darkness. I cannot say enough good things about Journey to the Heart! One thing so many of us want is to feel free. To step outside and feel the wind in our hair, to fly freely though life. The Four Agreements is a book guiding you towards that freedom. Miguel writes the book connecting to all the aspects of life we allow to hold us back. He talks about what society teaches us and how the feeling of being trapped is formed. And through all of this you somehow learn to create freedom in life. The Four Agreements is a book you could read over and over again and find a different meaning with each read. Every time I have read this book I have walked away from it with a new perspective and I have gained something different. Miguel outlines the agreements in four different chapters; be impeccable with your word, don’t take anything personally, don’t make assumptions, and always do your best. Each chapter discusses how these agreements affect our lives and how we can shift into freedom. I would recommend this book to everyone. It will absolutely empower you towards freedom. The realizations that I have had while reading this book have been life changing. The Four Agreements was a big part of finding personal freedom for myself! And I want to encourage you to experience it for yourself. Yoga is not just about the asanas and/or your physical practice. Debra explores the jewels as she calls in found in the Yamas and Niyamas of yoga. Almost like a guideline in life. This book is empowering you to take control of your freedom by living with a new understanding. Each yama and niyama opens up a different aspect of our minds. Debra does an amazing job at connecting with the reader by using personal experiences. The chapters focus on an individual yama or niyama while also bringing all of them together. As you read you begin to think wow this really is eye opening. The conclusions made when discussing each yama and niyama is profound. Debra’s writing is one of a kind and truly empowering. I have read from this book in several yoga classes and I have had countless people connect with those readings. One of my favorite readings and the one that so many have thanked me for reading is when she talks about letting go and trusting just like the trapezes artist does. The trapezes lets go of the bar flying free in the air trusting the next bar will come. Her connections and explanations of these “guidelines” make it easy to comprehend complex life philosophies and I find the book to be empowering. As you read this book you will feel one step, one thought at a time shifting and bringing you to a place of freedom and a new perspective of life. Wayne Dyer was an amazing and intelligent man. His understanding of life was profound. The Power of Intention is full of his amazing understand of life and the world. Two hundred and fifty-six pages of intention. Not only does the book cover what intention is and its power, it walks you through bringing that power into your life. When I came across this book it was a busy time for me and it took me a while to get through it. Each time I picked it up I was so impressed by what I read and each time as I read I felt the power of intention through Mr Dyer’s writing. Connecting personal experiences with world views and the beliefs of different societies gave me this strong sense of power within. Even just reading the first couple pages of the book I was empowered, I was reminded of how strong I truly am. This is one of my favorites and I still read parts of the book here and there. 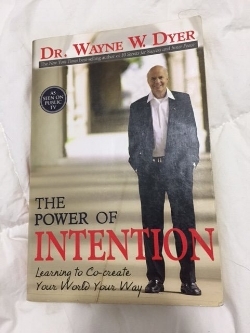 Your Intention is a force and Mr Dyer shows you that in this book. He shifts the common thought of intention as hard work and determination to being a power force that we create within. I encourage you to explore The Power of Intention. Take your time reading it and really letting it sink in. Get empowered with Intention! This is a book everyone should own. Without a doubt life changing! Every page in this book is about the mindset you choose. Carol has filled mindset with writing that opens up your eyes. She has researched this topic and has come out with some profound results. In mindset Carol turns research into an explanation of mindsets, digging deep and exposing how our mindset is so powerful in our lives each and every day. We are full of potential and our mindset is what allows that potential to be fulfilled or left empty. Did you ever wonder why some people fall apart when failure hits and why others pick up and keep going? It’s all about your mindset. Take the journey with Carol, chapter to chapter discovering your mindset, how you can shift it and how that mindset is so powerful in your life. I felt so empowered reading this book and learning all about the research and potential of the mind. Not only is this book about learning, you can and will shift your mindset beginning to see how powerful you truly are. Get a spiritual tune up with Outrageous Openness. Tosha does an amazing job leading you towards opening up your heart and mind to the divine. The book is so transformative; you will refer to it regularly. Throughout the book Tosha writes about experiences both personal and of others who reached out to her for guidance. Its all about opening up to the divine so much so that stress is taken off your back and life begins to flow. Letting go of control or the lead of your own life can be extremely difficult. Tosha writes about giving over the lead to the divine and not only does she talk about it she teaches you how to do so through her writing. Each mini chapter of writing begins with a profound quote leading you towards what is next. I am telling you this book is absolutely a gift from the universe. Easy to connect with and leading the way for you to let go, to feel free. Although I am still in the process of reading this book I have found myself feeling weightless. Like once I allowed myself to let go and open I could breathe clearly, a weight has lifted. And I know you would feel the same while reading Outrageous Openness.